Mole removal involves the excision of a mole, or melanocytic nevus, for biopsy or for cosmetic reasons. The procedure is typically performed on an outpatient basis, often in a dermatologist's office. Your doctor may use a scalpel to cut the mole out of your skin and then close the excision site with sutures, or he may shave the mole off the surface of your skin, creating only a small wound. Knowing how to care for your skin following mole removal will prevent infection, speed healing and reduce the likelihood of scarring. Clean your wound twice each day with diluted hydrogen peroxide or an antibacterial soap and water. If your doctor closed your wound with sutures, follow your aftercare instructions regarding whether you can get your wound wet. 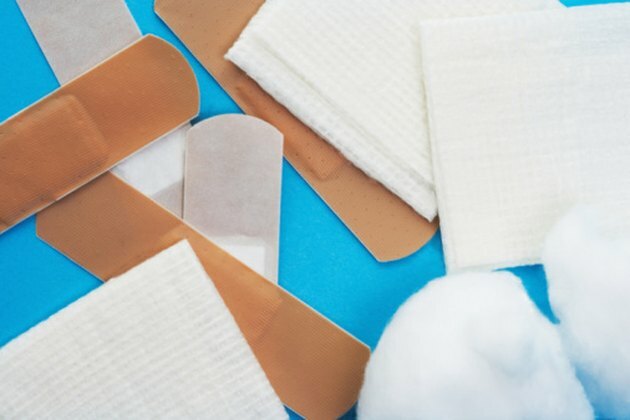 Apply an antibiotic ointment to your wound after cleaning, and then cover with a sterile bandage. Take over-the-counter pain relievers, such as ibuprofen, as needed. Cosmetic Surgery Guide states that discomfort following mole removal is generally mild and varies depending on the type of procedure performed. Avoid scratching or rubbing your wound during recovery. As your wound heals, it may itch. Keeping the area moist may help relieve itching. Return to normal activities immediately following your procedure. If your wound is located on a joint, such as the elbow or knee, movement may be uncomfortable due to pulling on the wound or on your sutures. Limiting your use of the affected joint for a day or two is typically sufficient to alleviate discomfort.